December was a bit of a roller coaster in the VoIP community. But the world didn’t end after all. In fact, we’ve got lots to celebrate as we break out the 2019 calendar. The demise of HiFormance left many of us in the lurch because it was a nearly perfect VoIP platform for Incredible PBX. Well, not to worry. So long as you have a backup of your settings, the transition to our latest discovery will be painless. And making a backup may still be possible. As we write this the Atlanta, Buffalo, and Los Angeles servers still appear to be operational and accessible. We’ll pause here to repeat our warnings about using what we call "sandbox platforms." These are dirt-cheap, cloud-based offerings that provide adequate VoIP performance for experimentation. But they may not be around when you wake up tomorrow. Then again they may keep chugging along for years. The point is don’t stake your business on resources like this and, if you can’t afford to lose one day’s lunch money, don’t sign up at all. We find most of these providers on the LowEndBox web site. They have a symbiotic relationship with ColoCrossing although we’re not quite sure how it works other than to note that they advertise specials from a number of new companies that apparently take advantage of ColoCrossing’s rental program which gets you a cloud-based server platform for under $50 a month with all the tools to set up your own hosting business. Some obviously oversubscribe their available resources, and you can typically spot these after about 5 minutes of aggravation attempting to log in. Almost all provide a 24-hour refund policy so it’s a good idea to sign up using a credit card provider that will go to bat for you if things go south. Having said all of that, we got at least 18 months of excellent service out of HiFormance in numerous locations. If you do that well on an investment of $10-$15 a year, you’ve done a good day’s work. HiFormance quickly became our development platform of choice because we could spin up servers in minutes, and they agreed to host the Incredible PBX® image for others that wanted to experiment. As we said above, this sort of platform isn’t for everybody and it isn’t suitable for production use. But, if you’re just learning about VoIP, it’s a perfect sandbox and the cost is less than you’d spend for electricity hosting a server in your home. Today’s Hosting73 offering provides a cloud platform with 1.5GB RAM, 25GB of SSD storage, and 2TB of monthly bandwidth for $14 a year. If you open a ticket after you sign up, they will double the monthly bandwidth at no additional cost. Ours was reconfigured in under an hour, and the initial setup took less than 5 minutes. All you really need to provide is a hostname and your name, address, and email. Once you get this far, you do need to read the two tutorials linked above. Happy New Year! UPDATE: We’ve been advised that SolvedByData now is blocking SIP traffic on UDP 5060 so we no longer recommend them as a provider. We’re updating this article with two new providers that now have passed our testing with flying colors. Above all else, a second provider gives you redundancy and considerable peace of mind. HostedSimply offers $15/year VPS servers in your choice of Buffalo, NY and Los Angeles for even better redundancy. Their pricing is slightly higher, but the performance is excellent. Open a ticket for a free upgrade to a 1Gbps Port pursuant to LowEndBox offer. Our third provider, AlphaRacks, is a company with whom we have had excellent results using their $22/year KVM offering. And now they’ve announced a $9/year OpenVZ platform with 1GB RAM, 20GB disk storage, and 1.5TB/mo. bandwidth. Their 1Gbit port upgrade adds $1.50/year. 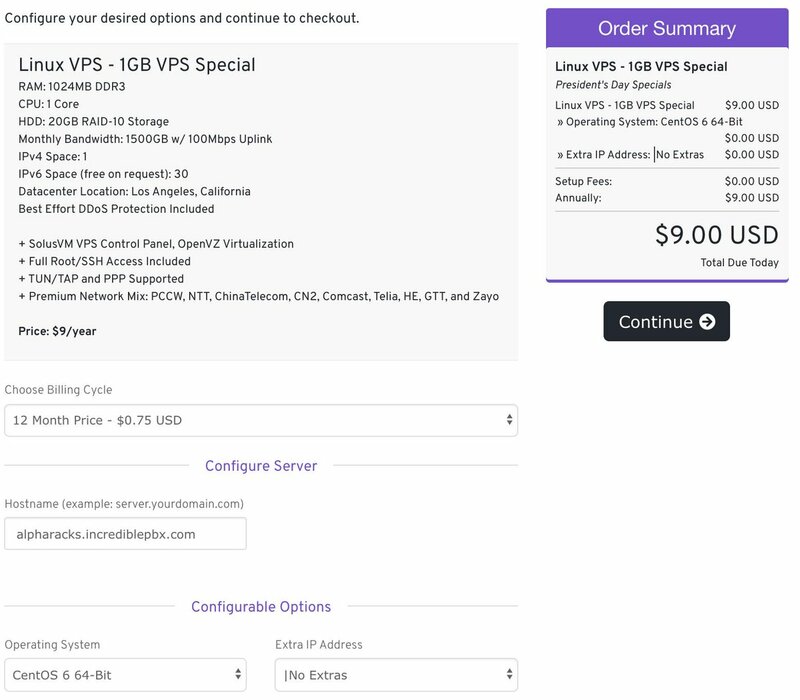 In order to add (recommended) swap space to your VPS, you’ll need to open a ticket. There’s no cost. Jan. 31 Update: We’ve now tested another provider, SnowVPS, that passes with flying colors. In the 1GB RAM space, they have both a $12/yr. OpenVZ offering with 15GB of SSD storage and a $15/yr. KVM offering with 10GB of SSD storage. Both include 2TB per month of bandwidth over a 1Gbps network connection. Their servers are based in Chicago. They support Debian 9 in addition to the other usual operating systems. Mar. 5 Update: We’re pleased to introduce another great provider, HostFlyte. In the 1GB RAM space, they also offer a $15/yr. OpenVZ platform using coupon: 20OFF. It features 30GB of SSD Storage, 2TB of monthly bandwidth, and a 1Gbit port. And you have a choice of four locations: New York, LA, Dallas, and Chicago. Our Dallas speedtest showed 727 Mbit/sec. download and 778.85 Mbit/sec. Very impressive! Mar. 11 Update: We’re pleased to introduce another VPS provider with admirable performance, HostBRZ. They offer 1GB RAM with 20GB SSD storage, 3TB of monthly bandwidth, and a 1Gbit port for $15/year in your choice of four locations: New York, LA, Dallas, and Chicago. Doesn’t it concern you that the look / feel of this hosting is suspiciously like HiFormance. As for me, I lost 3 years service x3 with HiFormance. I put in a claim with PayPal, HiFormance has the nerve to fight my claim! Burned once, ouch! Burned twice, that would be my fault! Sitting this one out. Paying the premium at Vultr. At least for production systems! Whether the sites are similar to HiFormance or not, these are really good deals for setting up test servers, it would seem. Is there an article or any info on redundancy of systems – specifically using one softphone on two different PBXs, so if one of these were to fail, the softphone can fallback to the other one? Just bought the special deal from solvedbydata. installed wazo 18.03 on debian 9 template, all sip trunk registrations time out. submitted a ticket to support and I was told media streaming is not allowed. Has anyone been able to run wazo or IncrediblePBX on solvedbydata’s VPS server? However, when from tcpdump, I can only see traffic from asterisk to remote sip server, nothing coming back. I checked with my sip service provider, they receive nothing from my IP address. It looks like solvebydata is blocking outbound SIP for no good reasons. I tested with 3 different SIP service providers, all failed the same way. Very disappointed with solvebydata, hope I can get a refund.